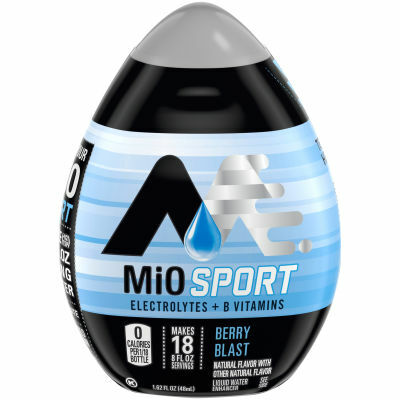 MiO Berry Blast Liquid Water EnhancerJust from the palm of your hand, be a magician and create a revitalizing and tempting drink with the all time favorite liquid water enhancer in Berry Blast flavor. It is built to help aid hydration during exercise with electrolytes and B vitamins. Squeeze the enticing enhancer in water to turn boring water into a sensational riving drink to refresh your mornings and invigorate your days.Easy to Make, Brilliant in TasteAlways dilute MiO goes a long way, makes 8 fl oz serving with one squeeze. No need to refrigerate it; simply click it twice to lock the freshness and alluring Berry Blast aroma, fragrancing the fresh moist air. Serving size 1/18 bottle (2.5mL/1/2 tsp).